IT’S A RAGS-TO-RICHES STORY, OF SORTS. The middle son of a Turkish shopkeeper travels to America to learn English and earn a master’s degree in mechanical engineering. Ten years later, he returns home and transforms the tiny family business into one of Turkey’s most successful global enterprises, with offices in 50 countries and employing more than 12,000 people. Growing up in the city of Samsun on the Black Sea in Turkey, Yüksel Yildirim worked at his family’s small construction materials and building supply shop after school and during the summers. He and his two brothers loaded and unloaded trucks, hefted bags of cement, and carried lengths of rebar for customers who came into the cramped storefront for construction materials. The work was hot, dusty, and difficult. Growing up, Yildirim used to ask his father why he worked so much. “He would always reply, ‘I’m working for my children — for you,’” Yildirim said. Now, at age 58, he is president and CEO of Yildirim Group of Companies, a vertically integrated Turkish industrial conglomerate based in Istanbul with operations all over the world. Although Yildirim’s mother never attended school and his father only finished elementary school, both parents encouraged their three sons to pursue an education. Yildirim took it to heart, earning a mechanical engineering degree from Istanbul Technical University, and then asking his parents if he could travel to the United States to continue his education. They agreed that he could stay for only three years. 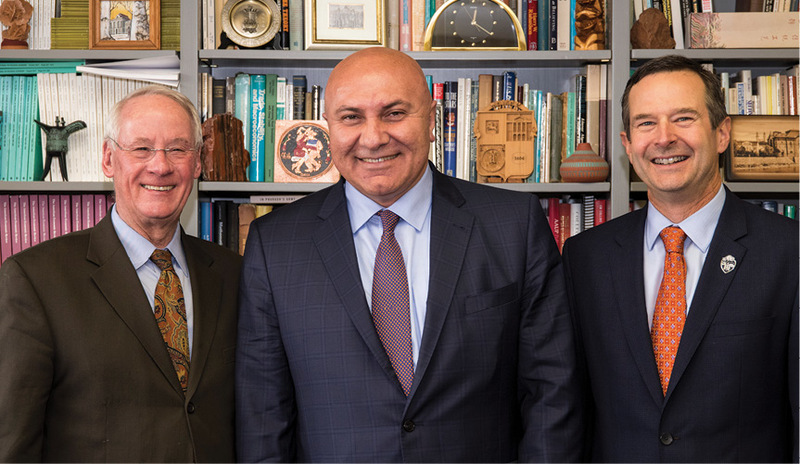 From left: Oregon State President Edward J. Ray, Robert Yildirim, and Dean Scott Ashford. After studying English for a year at California State University, East Bay, near San Francisco, Yildirim followed a Turkish friend to Oregon State. He says he felt like he had landed in another world. He liked the slower pace of Corvallis and dove into his engineering studies and campus life — playing soccer and founding the Turkish Student Association, which he led for two years. It was also at Oregon State where Yildirim met his future wife, Yolanda Harris, who was studying accounting and business in the College of Business. Yildirim took engineering classes that included computer-aided design, manufacturing, robotics, computer graphics, optimization, expert systems, and design methodologies. 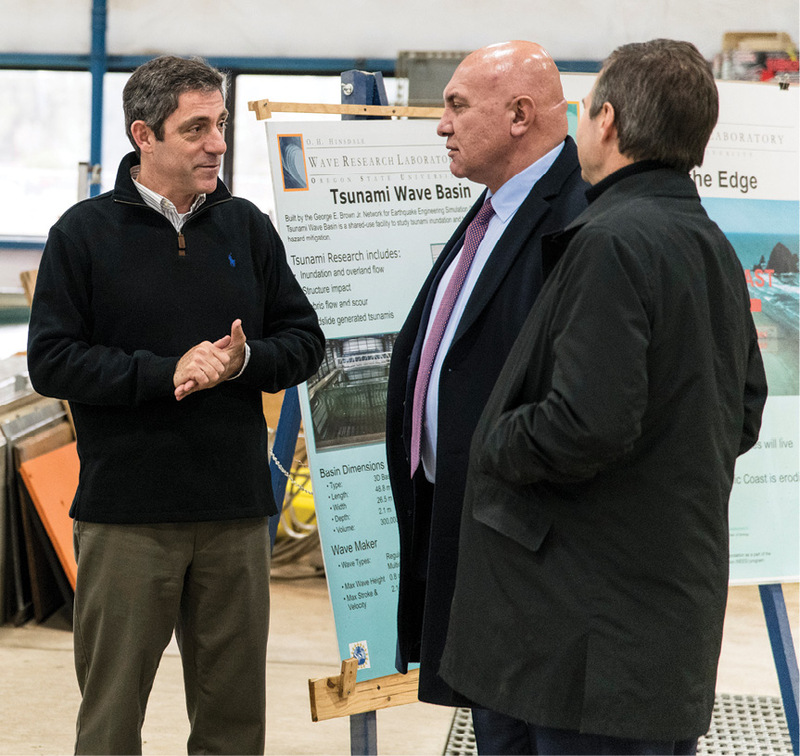 Dave Ullman and Eugene Fischer were among his favorite professors, both of whom he credits with teaching him the engineering methodologies he uses today when making business decisions as the leader of a multimillion-dollar global enterprise. After finishing his master’s degree (’89 M.S., Mechanical Engineering), he started to pursue a Ph.D. at Oregon State, when his parents said it was time to return to Turkey and help with the family business. They had agreed to support him for three years, and those three years were up. Yildirim began applying for various engineering positions in the U.S., but as soon as interested employers learned he wasn’t a U.S. citizen and didn’t have a green card, the interest ended. Yildirim went to the Oregon State library and researched first names from a directory that listed board members of Silicon Valley electronics companies. “Robert” seemed to be the most popular, so Yildirim added “Robert” to his resume, reducing his Turkish first name to a middle initial. Soon, “Robert Y. Yildirim” was getting job interviews and quickly landed an engineering position with PACECO Corp., which is affiliated with the Mitsui Group, a company in Hayward, California, that designs cranes for ports and container terminals. Robert Yildirim tours the O.H. Hinsdale Wave Research Lab with Scott Ashford and Lab Director Pedro Lomónaco. Yildirim worked at PACECO for five years, where he also earned a patent for his design work. Finally, he returned home to help with the family business, which employed 15 people, including his father and two brothers. Yildirim knew that joining the business meant he would no longer work as an engineer, and although it saddened him, he made the best of it. He researched business opportunities in Turkey and plotted how he could use his command of English to expand business into other countries. His family had done some domestic coal trading, so Yildirim started there, traveling to Siberia to explore import opportunities. He applied what he’d learned while working at PACECO to developing relationships with his Russian partners. The early days were challenging because the communications system in Siberia was rudimentary, at best. To talk by telephone with his brothers and parents back home, Yildirim had to place a call at the local post office and then wait 24 hours or longer for the call to be put through. But when his business dealings in Siberia started to bear fruit, Yildirim knew he was onto something. The family business continued to grow, with Yolanda handling the accounting while Yildirim focused on the import-export components. Success took hard work, along with some fortunate timing. In 2001–2002, an economic crisis hit Turkey, prompting governmental change. Yildirim’s business was able to purchase two bankrupt companies: one that mined chromium for use in stainless steel manufacturing, and one that made fertilizer. The Yildirim Group started acquiring more struggling companies in Turkey and making them profitable. In 2008, the group made its first international acquisition, purchasing a Swedish company that supplied raw materials for stainless steel. Since then, acquisitions have snowballed, and the Yildirim Group is now among the top international players in the global shipping industry, container terminals, and chromium. The group is also heavily involved in a range of other industries, including fertilizers, chemicals, port management, energy, metals and mining, coal and coke, logistics, shipbuilding, industrial construction, real estate development, and private equity. in person and hard work. Although he’s not technically functioning as an engineer, Yildirim says he uses some of what he learned at Oregon State to help him make the constant stream of decisions he faces every day. Yildirim often interfaces with businesspeople who are not engineers but have degrees in finance or other areas of business. These days, Yildirim does a lot of what he calls “financial engineering,” dealing in billions of dollars and meeting regularly with top bank executives at Goldman Sachs, J.P. Morgan, The Carlyle Group, Morgan Stanley, The Blackstone Group, and others. Yildirim says his success is due to a combination of educational opportunities he’s had throughout his life, but his time at Oregon State stands out. From left: Pedro Lomónaco, Robert Yildirim, and Scott Ashford. It’s not surprising that the Yildirim Group supports educational projects in Turkey and beyond. It has built three technical high schools and seven elementary schools in Turkey — donating all labor and materials and giving the finished buildings to the nation’s education system. A charitable foundation named after Yildirim’s father and mother (Garip and Zeycan Yildirim Foundation) supports low-income students with scholarships and also funds a range of medical, environmental, and cultural causes — both in Turkey and in many of the countries where the company does business. In some of the rural locations where the Yildirim Group has mining operations, the company pays for youth activities and soccer tournaments, so the children are occupied and learning — and less susceptible to the recruiting efforts of terrorist organizations. Recently, the Yildirim Group funded a $300,000, two-year research project with Julie Tucker, assistant professor of mechanical engineering at Oregon State, to develop a special nickel-chrome superalloy for power plants that use supercritical carbon dioxide. The alloy must be both corrosion resistant and able to withstand temperatures of 500–800 C.
Are Yildirim’s parents proud of their middle son and his trajectory of success? His brother’s death gave Yildirim a reason to pause. For now, Yildirim is working hard, because he wants to see the Yildirim Group continue to grow worldwide.